Earlier this summer I wrote about my concerns regarding children spending so much time in organized activities. As a follow up, this newsletter is about free play outside. Many parents contacted me to express relief at not being the only one with a child who protested camp or afternoon activities, or refused to go to gym class, or sat on the sidelines of activities. Others reported feeling comforted that their decision to keep summer and afterschool time uncommitted was fine, even if it went against the trends in their community. Without the goal of getting out for an organized activity or class, you may wonder how to motivate your child to go outside. Getting your little one out the door can be a challenge but that should not stop you. The alarm has been sounded. Little children are more sedentary than ever, spending more than 80% of their time indoors and sitting. This is worrisome given that lack of outside play is tied to increased obesity rates, attention problems and life long health problems. Bottom line: Missing out on outside play is not good for your child’s development. Plus, once outside children are almost immediately happy to run and play. If you make outdoor play part of your routine, it easily becomes a daily habit and something your child can look forward to. REFLECT ON YOU: Before I address why outside play is so critical, take a moment to reflect on your childhood and the time you spent playing outdoors. Think about what you were doing, who you were with (or maybe you were alone), the place, the scenery. What do you recall and how did it feel? Adults tend to recall feelings of freedom, creativity, joy and connection to others and nature. I remember running through sprinklers and spraying my siblings and friends with yard hoses. The sidewalks where I grew up were stone slabs that got slippery when wet (a child’s dream) allowing us to ride our bikes and skid, slip and slide. Maybe you recall running around, climbing trees, or walks in the woods; picking berries, biking or playing ball. Hold on to those memories to remember why outside play matters to your child. WHAT’S GOING ON? Young children learn by doing and through their multiple senses being used together. Moving their bodies is more than simply physical exercise (although it is that, too). Physical activity stimulates brain connections that lay the foundation for ongoing learning. Being able to listen, focus, persist, and handle emotions are required for learning and these skills are developed and reinforced through active outdoor play. So are motivation, persistence, resilience and adaptability, imagination and curiosity. Getting messy outside is very good for children! Children are multi-sensory discoverers, learners and do-ers. Outside they use all their senses, taking input through seeing and observing, listening and hearing, touching and feeling their bodies move in different ways, at different speeds, with different amounts of force, as well as smelling, and even tasting. The more children move their bodies, the better they are able to listen in school and attend to a variety of tasks. Does this connection between movement and other developmental areas surprise you? The body and physical sensory input are directly tied to brain development. Even more, being outside puts your child in touch with nature, helps them feel a sense of freedom that builds confidence, and allows them to take risks. Risks are an important part of learning as your child figures out what she can and can’t do. 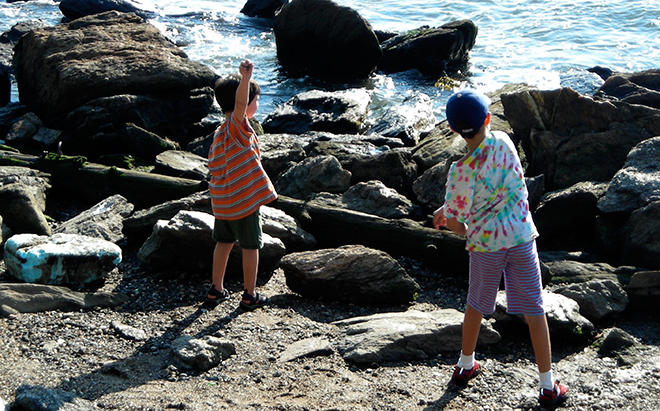 Outside is freeing and gives young children ways to expend energy and feel that great sense of autonomy they crave. 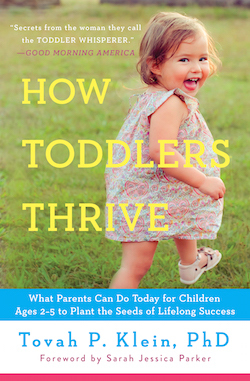 It’s exhilarating, especially as toddlers take steps towards being their own person. By feeling independent, that they can make decisions and move however they decide, it can help cut down on control battles with you. No one likes to be told what to do, especially not toddlers. Outdoors provides the place for your young child to be free and to choose, shout, to be loud, messy and curious, with few rules beyond safety considerations. WHAT YOU CAN DO TODAY: There is a wide range of outdoor activities and no ‘right’ way to play or be outside. Some of it depends on where you are and what is available- a yard, a park, a mountain or stream. When we hiked one summer in Colorado, I was impressed with a family with a 3-year old that was hiking steep paths I myself found straining. He trotted along, stopped when needed, and made the full path. His parents delighted in this and so did he. Being outdoors connects children to nature, the start of appreciating and taking care of it. Backyards, front yards and playgrounds: Children have the freedom to choose what they want to do from running around to digging, making sand creations, swinging, climbing, jumping in puddles or playing with friends. There are no set rules and no set way to play. Find places in your community for your child to have open play. Taking a few toys, such as balls, bubbles or sand toys can augment play. Sidewalk chalk is easily portable. But let what your child does be up to him or her. Gardening, digging and mud pies: You needn’t be a gardener yourself for your child to enjoy digging in the dirt. If you have a garden, let your little one help to plant seeds, water and weed. My youngest learned to grow plants and vegetables at his city school (growing plants also teaches science, math, vocabulary and builds confidence as the vegetables come to fruition). In the summers we are part of the watering team and he gets to pick herbs and vegetables. Digging in any mound of dirt can be a fun activity, as is looking for bugs, worms and other creatures. Count the ants, pick up the worm, pour water into dirt and let it dry for mud pies. It is all about discovery while they are gaining appreciation for the earth and soil. Climbing, running, jumping and more: Moving and climbing helps children figure out their bodies and how to use them. Which foot goes first? Where do I hold onto? Children have to experience these moments and feel them in their body to master them. It helps children gain control over their physical abilities and that feels good. Movement builds confidence and helps them take chances by trying to climb higher or in new places, to run faster or be chased. It also gives them new angles to see from up high, new perspectives. These are all important parts of learning about themselves and making connections in the brain. When one of my children learned to climb an odd-shaped climber at the playground, he did it over and over for days until the excitement wore off and he moved on to learning a newer, harder climber. Mastering physical challenges motivates children. Collecting and building. Many children are collectors. It is a way of organizing and making sense of the world, of gaining control. Sticks and rocks are collectible, and children like to sort them by size, shape, or in other ways. They do this naturally, without direction. Why do they do this? In a big world, where little ones are learning all the time and much is new to them, it feels good when things go together. That brings an inner sense of calm and pleasure. Children also like to build- from what they collect, with sand, or sticks that become forts. One year, my kids and neighborhood peers spent weeks after school adding on sticks to a fort they were creating. It took much collaboration, negotiation, searching, finding and decision making before they got to the finished fort. Butterflies, beetles & bugs: Many children find endless fascination in things that move. There are lots of moving things outside. Bring a container with a lid with holes to put bugs inside. Let your child figure out what they need to eat. I was the mother of inch worms one year that turned into moths, one by one. I didn’t love it, but my kids did! They researched what to feed them and how to keep them watered. Plastic magnifying glasses can be used to examine bugs and worms as well. The outdoors swarms with opportunities for exploration and discovery. Support your child’s need to move and raise them in nature! Have a great outdoor idea you’d like to share? I’d love to hear what works (and doesn’t) for your family. Share your comments on Facebook or Twitter.